Provide comfort for the family of Andrea Cooper with a meaningful gesture of sympathy. 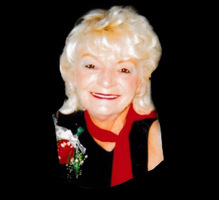 Andrea Cooper, 77, of Coventry, CT passed away peacefully at home. She was born to the late Ernest and Jennie Marsh in New London, CT on December 24, 1941. Andrea graduated from Windham High School and went on to complete cosmetology school at the CT School of Hairdressing. She worked as a hairdresser in Hartford and at Magic Mirror in Manchester. Andrea was a talented hairdresser who was known to travel to her clients’ homes to make them look their best, she even did hair in her own kitchen. Andrea married Richard Cooper in 1962 and they spent their life living in Coventry and serving their community. Andrea dedicated years as a member of the North Coventry Volunteer Fire Department Ladies Auxiliary. Andrea was an avid fan of UCONN Women’s Basketball. She loved working outside in her flower beds and 2 fish ponds. She delighted in watching the birds that fed at her many bird houses. She enjoyed tag sale-ing with her husband, Richard, and kept her mind sharp solving sudoku puzzles. Andrea had a special love for her pet dogs. Andrea was devoted to her family. Andrea loved to spend time at the cabin in Vermont with her friends and family, skiing and snowmobiling. For many years as her daughter, Brooke, was growing up, she spent her summers at Black Point Beach. Andrea was so proud of her grandchildren who she adored and loved to speak about their accomplishments and share their pictures. Granddaughter, Amani said that she was lucky to have a grandmother who was a hairdresser, because she taught her mother the skills needed to do her hair. McKena remembers how much her grandmother loved putting puzzles together. In addition to her husband Richard, Andrea is survived by her daughter, Brooke Clemons and her husband, Todd Clemons; grandchildren, Amani Clemons and McKena Clemons; her sister, Virginia Smith of Mansfield; and nieces Lori Lalla of Fort Lauderdale, FL, and Joelle Carbonell of Ellington. Andrea died as she lived, loved by her huge extended family and friends. To send flowers in memory of Andrea M. Cooper, please visit our Heartfelt Sympathies Store. Provide comfort for the family of Andrea M. Cooper by sending flowers. I’m so very sorry to hear of Andrea’s passing. We spent many fun times together when we were all involved in the fire department and other times also. She was a good person and a wonderful friend.